About the User: This project was commissioned by a client who manufactures and sells metal electricity conducting products. Part of their product range is made up of copper which sees large fluctuations in price, so ensuring that prices are current is essential to their business. Project Brief: To do away with the 120+ individual customer price lists and allow review and management of the prices within one central database. These prices are then automatically read into QuoteWerks and Sage 200 when sales people quote and/or take customer orders. Management of customer-specific product pricing lists based on individual component price and also within a banded group based on the LME price to allow for metal price changes. Management of default price lists for products sold without customer-specific pricing. Spreadsheet import and export for customer review and updating. Ability to update groups or all product prices by a fixed or percentage amount. Reading prices into QuoteWerks and Sage 200 when users are creating or updating Documents. 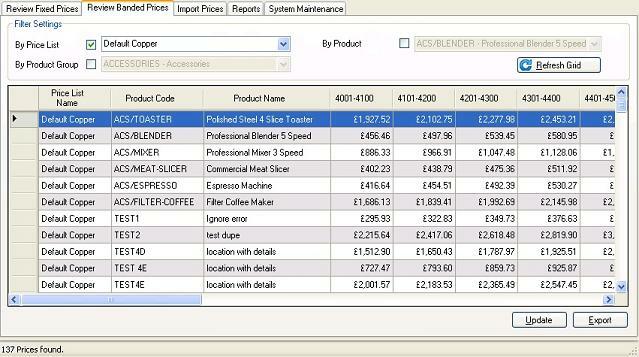 Quick, easy and accurate management of prices within one central database. Considerable amount of time saved because prices are automatically read into QuoteWerks and Sage 200 so users don’t have to look prices up from a spreadsheet to manually enter them. Improved quoting accuracy and risk of human error eliminated through systemised solution. Ability to quickly and easily compare prices across different customers and product lines. Where applicable, easy to rationalise one individual price list to a number of customers.